Born with a terrible facial abnormality, this shy, bright ten-year-old Auggie Pullman has been home-schooled by his parents for his whole life, in an attempt to protect him from the stares and cruelty of the outside world. Now, for the first time, Auggie is being sent to a real s... read full description below. 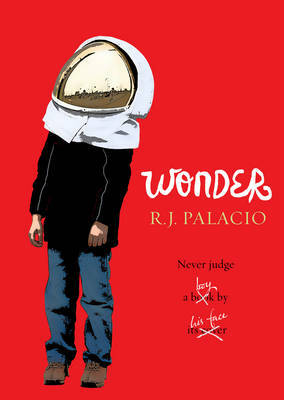 Wonder is the funny, sweet and incredibly moving story of Auggie Pullman. Born with a terrible facial abnormality, this shy, bright ten-year-old has been home-schooled by his parents for his whole life, in an attempt to protect him from the stares and cruelty of the outside world. Now, for the first time, Auggie is being sent to a real school - and he's dreading it. The thing is, Auggie's just an ordinary kid, with an extraordinary face. But can he convince his new classmates that he's just like them, underneath it all? Through the voices of Auggie, his big sister Via, and his new friends Jack and Summer, Wonder follows Auggie's journey through his first year at Beecher Prep. Frank, powerful, warm and often heart-breaking, Wonder is a book you'll read in one sitting, pass on to others, and remember long after the final page. R. J. Palacio is a graphic designer by day and a writer by night. She lives in New York City with her family and a black dog called Bear. Her critically acclaimed debut novel, WONDER, has sold over 2.5 million copies worldwide and has spent over three years in the UK and US bestseller charts.